We can freely say that a key characteristic of Kosovo’s history is that it has had no cities – in the literal sense of the word that was used in medieval Europe. A characteristic of European cities until the end of feudalism was their distinction in trade, whether through sea ports, or other trade routes, while villages were mainly engaged in agricultural activities. This economic independence also led to the creation of powerful city-states of the Medieval and Early Modern periods, which had their own legal charters. Although in Kosovo cities at this time had a developed trade, their trade had more of a local character and cities were not completely detached from agricultural activities. Agriculture still existed in cities, which were inhabited mainly by a rural population. During the Ottoman period, the cities of Kosovo grew into the judicial and political centers from which villages could be administratively controlled. Historically, until the middle of the last century, villages in Kosovo were characterized by tribal feudal relations, where law and order kept a medieval precept, where patriarchy ruled as a dictatorship, where administrative and political organization was performed through village elders, as a form of political self-organization etc. Although today’s villages lag in comparison with cities, the breakthrough of education, health etc. in socialist-era Yugoslavia revolutionized rural life. Nevertheless, the biggest change in the physiognomy of the village—a change hardly for the better—took place in the 1990s. 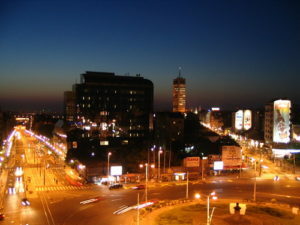 The capital of Kosovo, Prishtina. The radical transformation in structure and in social relations occurred because of emigration from rural areas. Being the most underdeveloped economic zone – even in the period of socialism – when Yugoslavia opened the borders in the ’60s and ’70s, the Kosovo villages became the first that supplied workforces to German factories. Currently, while some of these workers are the second or third generation abroad, we can say that villages have been economically and culturally enriched because of emigration and remittances. The workers who went there – regardless of whether they returned or not – contributed to the socio-economic reformation of villages. Even today, many municipalities have richer villages rather than cities, partly because after the 1990s, industrial production, which was the main source of welfare for urban residents, was paralyzed. As a whole, however, Kosovo’s villages are—unsurprisingly—less developed than its cities. Another gauge of the differences in social welfare and consumption is the fact that three-quarters of those who declared that they do not possess any phone come from rural areas, while three-quarters of those who stated that they have a landline and mobile phone come from urban areas. About 75% of those who stated they have no internet at home come from rural areas (as a whole, more than half of rural households do not have internet access or computers). Another important indicator of the urban-rural divide in Kosovo today is the rate of illiteracy. In all data from 1999 to 2009 it is noted that in rural areas illiteracy is approximately twice higher than in urban areas (8.8% to 4.3% in 1999 and 8.4% to 5.4% in 2009). Also striking is the discrepancy in gender differences in illiteracy: in urban areas, illiteracy amongst women is more pronounced than in men (7.5% to 3.3%), but in rural areas this disproportion is even greater (11.3% to 5.5%). The greater economic opportunities available in the cities have resulted in the fast depopulation of rural areas (Marec village in the municipality of Prishtina lost nearly one in six of its inhabitants over the past 10 years). While in the capital of Prishtina, the population for the past six decades has increased tenfold, its surrounding villages have stagnated or had a symbolic increase of 10%. But it is only after Yugoslavia’s collapse that rural migration to urban centers or abroad pushed a number of villages to the brink of extinction: For example, Prapashtica, a beautiful mountain village, had 121 households in 1991, whereas in 2008 there were only 32. The village of Beleg, Kosovo. Migration has affected not only the numbers but also the gender composition of Kosovo’s population: while in urban areas there are more female inhabitants, in rural areas there are far more men than women. This speaks a lot about the social structure and attitudes of the Kosovo village, where patriarchal attitudes remain entrenched in the culture and collective consciousness of the people, according to which, having a boy is much more preferable than giving birth to a girl. As far as the ethnic structure of the Kosovo villages is concerned, the stand-out ethnicity is the Serbian minority. According to the census of 2011, about 90% of Kosovo’s Serbs live in villages, mainly in their enclaves in central, eastern and northern Kosovo. Generally, the other ethnic communities in Kosovo, too, live largely in rural areas (62% of the population), with the exception of the Turkish community 2/3 of whom live in urban areas and the Roma (63% in urban areas). But, without a doubt, Kosovo’s villages will continue to be underdeveloped in contrast to cities as long as the government’s economic policies continue to ignore the question of equal development. With a government that has a final goal in maximizing privatization and asphalting as much as they can to satisfy the eye rather than the belly of its citizens, both cities and villages will be lagging in the overall social development, which will affect the population, including more and more young people who intend to leave the country, seeing no economic perspectives and having no trust in essential changes that every political party pushes in their campaigns. 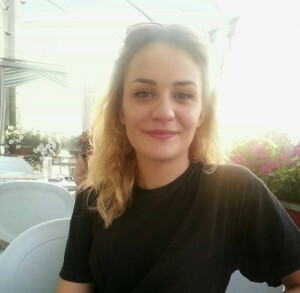 “Rise Above!”: Students of K ..
Eurisa Rukovci is an activist engaged in social change in Kosovo. She studies psychology with a focus on social psychology.